And there you have it: the perfect revenge. We got to this part in the story and she laid out the revenge. I said “that’s it?” She said “yeah!” So, why not. An elaborate plan can be a simple murder, sure! You don’t argue with kid logic. So. Yeah. Rainbow Girl’s dead. Enjoy your meal, Wexter. The story’s not over yet. Next week: Lightning Boy strikes back. Charlie has lost a Wii game. “Come on mommy, let’s get up! I sitting up, you sit up! I liked the orange juice twist. 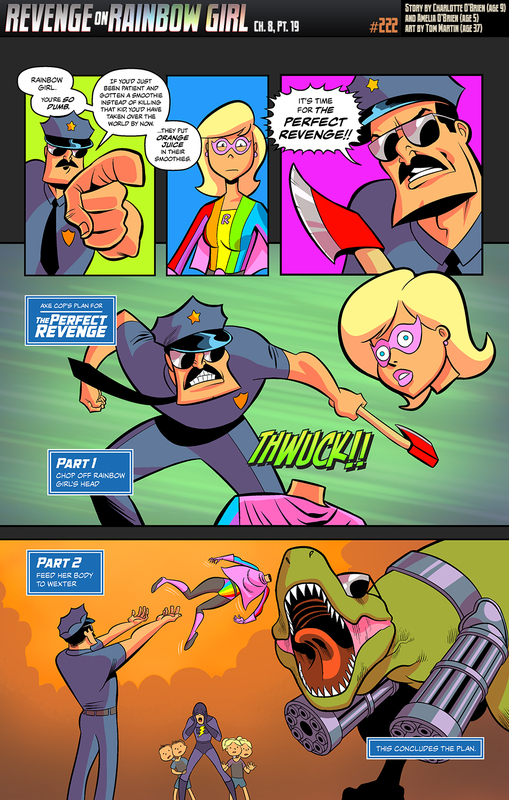 I might have guessed that after beheading Rainbow Girl, Axe Cop would barbecue her head and flush the body down the potty, but now I realize that’s the wrong version of “Joy to the World” for this comic. 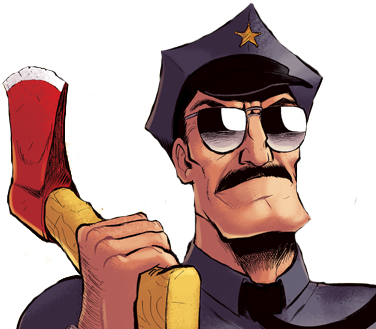 Axe cop’s logic rule!! Nice to see Wexter’s role in the plan! I’m just surprised it took them two whole days to come up with that plan. HA! I love it! Humiliate the villian right before you kill them!!!! Maaaan kids are instinctually brutal aren’t they? Also, I love the simplicity of it. No monolguing or time wasting, just boom killed, and eaten. The eating part is important. That way she can’t come back….oh wait…this is a comic…forget I just said that silly thing. > Next week: Lightning Boy strikes back. They forgot to throw her head in the head trash.